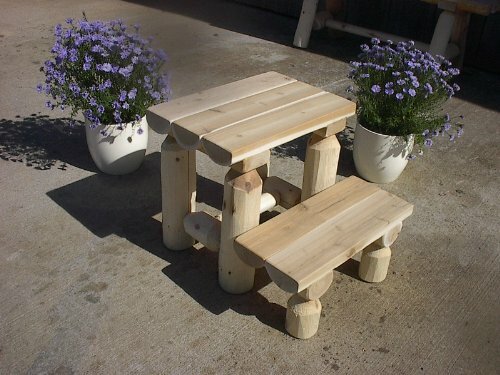 White Cedar Log Step Stool by Furniture Barn USA at Indsight. MPN: WCLSS. Hurry! Limited time offer. Offer valid only while supplies last. White Cedar Log Step Stool: Stop stretching and straining for c This white cedar step stool will allow easy access to any item in your home or out. White Cedar Log Step Stool: Stop stretching and straining for c This white cedar step stool will allow easy access to any item in your home or out. And with sturdy Amish construction, weight will not be an issue. Portable and pretty, you'll find a thousand uses for this cedar step stool. Total Dimension: 18" wide, 16.5" high. -Proudly made in the USA! Finely crafted by the Western Pennsylvania Amish. -Naturally resistant to decay, insect and weather damage. Rust-resistant steel hardware. -Sturdy 4"-5" cedar log construction with solid mortise and tenon joinery. -Beautiful naturally unfinished! -No assembly required. -Custom Made to Order: Allow 15 days for construction before shipping NOTE: The last pictures shows how cedar log furniture can and likely will check.. checking is when the logs dry out and get some long cracks in them this is natural and has nothing to do with the structural integrity of the piece! Stop stretching and straining for those top shelf items with this versitle White Cedar Log Step Stool! Proudly made in the USA! Finely crafted by the Western Pennsylvania Amish!